Question: Will A Heavier-Gauge String Hurt A Floating Bridge? If you are tired of fighting with your current setup, hopefully, this rundown of review based suggestions for sets currently available in 2019 will get your sound on the right track. Even if you don’t have the best guitar for heavy metal, these heavy gauge strings will bring out more of the tone you are looking for, allowing you to convert just about any guitar into one that can play some metal. I also have an article on the best electric guitar strings that offers a lot of background information that new metal guitarists will find helpful. I cover a list of strings that are ideal for metal players. Put these on, and you’ll get the sound you are looking for. However, I also love empowering new players the knowledge they need to make the absolute best decision for their playing style. If you want to get into definitions, you should scroll down to the buying guide. Rotosound tends to get overlooked. Unless you already know about the brand, you aren’t likely to run across them when shopping online. They are more expensive than most strings and super easy to overlook. However, Rotosounds has one of the largest pedigrees of any company. A British company, they have been used by some of the biggest names in music, including the likes of Michael Paget (Bullet For My Valentine) and Cliff Burton (Metallica). While they make strings for every genre, I really love their Pure Nickel 10 and 11’s. 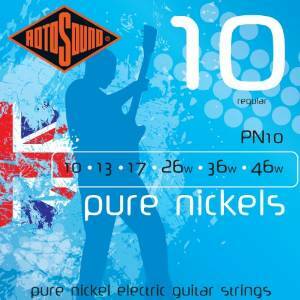 Heavy enough for any tuning, the pure nickel tone delivers that incredible, rich sound. Not to mention, it really seems as though their products are better designed than most and you’ll typically find yourself playing them an extra month or two longer than you would have with most of the competition. As I said, they don’t have a lot of hype and you really have to dig to find any marketing on them. But they have that vintage sound, are a pleasure to play, and offer that unique sound that very few of the other local guys will be playing. But if you are looking for a brand that is more worried about sound than they are market share, these are the guys to go with. Go with the Silvers with their hex core and nickel windings (Yellows can be good as well.). With a heavy gauge of 12 to 52, this string set gets complaints from “normal” guitarists. The G string is a wound string which gives greater resonance and works well when you are using hot pots. However, it can have the side effect of being a little muted on the normal rock setup. 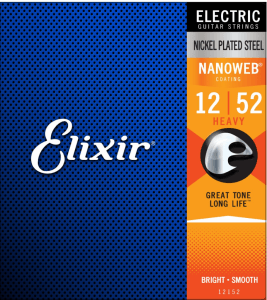 These strings are coated in Elixir’s nanoweb coating. Traditionally, string makers would simply spray their steel strings with Teflon coating (or a similar variant). These coatings protect the strings from your finger oils and prevent rusting, extending the life of your strings. The downside with coated strings is that they feel very slick. This slippery texture is a little weird to play with. By going with a nanoparticle coating, Elixir is able to still coat their strings but without that slippery feeling, we hate with normal-coated strings. They feel very normal and play well. Their warm, vibrant tones give you plenty of power for running it through a distortion pedal. The huge upside is that these hold up well to daily playing. Most guitar players who use them for daily practice find that they can get about 3 months out of this set of strings. Folks who play less frequently will take these to 6 or 8 months of use. It’s about twice as long as most other strings, and they don’t have that nasty black look when it comes time to change them. These strings are perfect for Drop A and Drop D tuning. You can probably get them down to about a C#, if you wanted to be that aggressive. they are often compared to the NYXL strings which is one of my favorites. It’s the perfect blend of longevity and playability and is a brand trusted by artists like John Paul Jones and Wayne Sermon. A lot of the strings on this list are catered to be the best metal guitar strings. Especially the first three on my list. They want to deliver excellent tone, a unique sound, and phenomenal playing experience. The Dunlop goes a little further into developing a better sound. These steel strings are wrapped in their unique nickel wound wrap ratios, designed to control the amount of nickel material used against the steel core interior. This guarantees that you get a different tone than the other strings on this list. This set is part of their performance + series and delivers a concert-level performance. The most noticeable difference with these strings is the clarity they deliver. They offer better attack and a clear tone while still retaining plenty of fatness. You’ll need to tweak your EQ and Preamp a little bit as they are a better different tone from the competition. It’s one of the few strings on this list where you can hear the difference. Regardless, you notice in real-life that you are spending less time fiddling with the tuners. If you are jamming hard and frustrated with other strings constantly losing their tone quality as you practice than this would be a good set to consider. We reviewed this set when looking for the best strings for an electric guitar. Those were the light gauge strings that are ideal for rock and jazz. What we noticed is that they seemed to hold their tension better, while still being bendable. 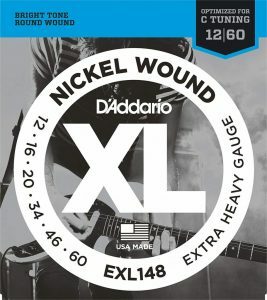 If you need thicker strings for drop tuning, they offer a 12-54 set that is absolutely perfect, and an extra-heavy 12-60 set if you are looking to go down to Drop C. Because these strings are known for their stiffness, I’d only go for the larger string gauge if you know you are going with the low tunings. The other attribute that makes this string a favorite is that they tend to last longer. Sure, you pay slightly more, but once you average it out over time, it works out to be very similarly priced. The nice thing about Ernie Ball strings is how affordable they are, and how much customization they offer. Want a heavy setup? They have you covered, offering the beefy slinky’s in an 11-54. These are designed to be drop-tuned without adding to much slop to your playing and to keep the feel of the action close to a normal configuration. Want a light/heavy combination? They got that for you, too, and their skinny top heavy bottom is one of my favorites — especially if you do a lot of soloing for your metal band. Not only do they make some high-quality strings, but they are some of the most affordable. So you can pay for like 3 packs of these before paying for one pack of the Rotosound’s. This makes them ideal for playing around with different weights. Find something you like in the Ball’s and then upgrade to the Elixir, D’addario or Rotosounds. Dialed in, for a fraction of the cost. Additionally, they have a huge following as practice strings. And there are those who swear by them as their daily gigging string. Slash likes them since their stainless steel string construction tends to last longer than most other non-coated brands. I think there are a lot of great brands on this list, and unfortunately, that is pushing some of the classic standards a little lower. 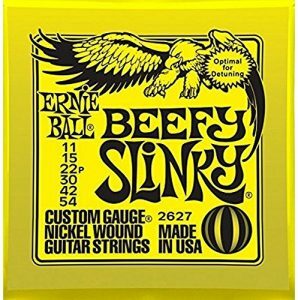 If you are drop tuning, go for the Beefy Slinky’s to get the power chords you are looking for. Otherwise, I think you’ll like the Heavy Bottoms that give you a light top string for soloing with heftier low-end notes for that driving rhythm. These guys know how to focus on what matters. As manufacturers of strings not only for guitars but also for violins, cellos and other instruments, they have a huge reputation to uphold. This is the brand that folks use when they want to improve their sound or have a professional gig. And uphold it they do. 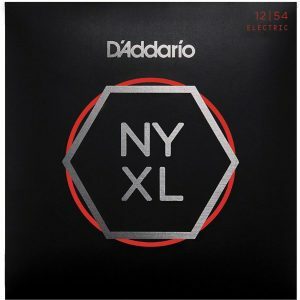 With D’Addario, you are getting a quality string that will last and will sound great. The nickel plating is sufficiently high enough for the string to sound great with any pickup, and these strings are known for having some of the lowest “buzz” and ghost noises. They didn’t use to advertise a “heavy metal” string. However, in the last couple of years they have created a 12-60 set, giving you a string that you can easily tune down to a Drop C. I feel like the 148 is a little heavy for a Drop A tuning as the strings would be a little loose for most folks. I know a lot of folks overlook these because, once again, they don’t have as much branding among practitioners of the darker arts. However, they are sort have an underground favorite in many forums. If you want my advice, try the EXL 148’s for drop tuning. They are too stiff to play in a standard tune . They seem to offer the best blend for creating that overdrive sound without requiring you to have the forearms of Hulk Hogan to play ’em. 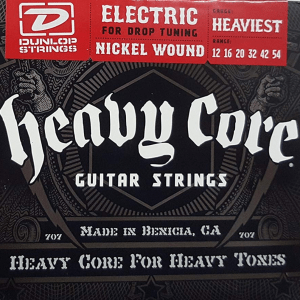 These are excellent, soft-nickel strings that won’t chew up your fretboard even though they are the heaviest gauge strings on the review list. I would wipe them down after practicing to try to extend their life as much as possible. 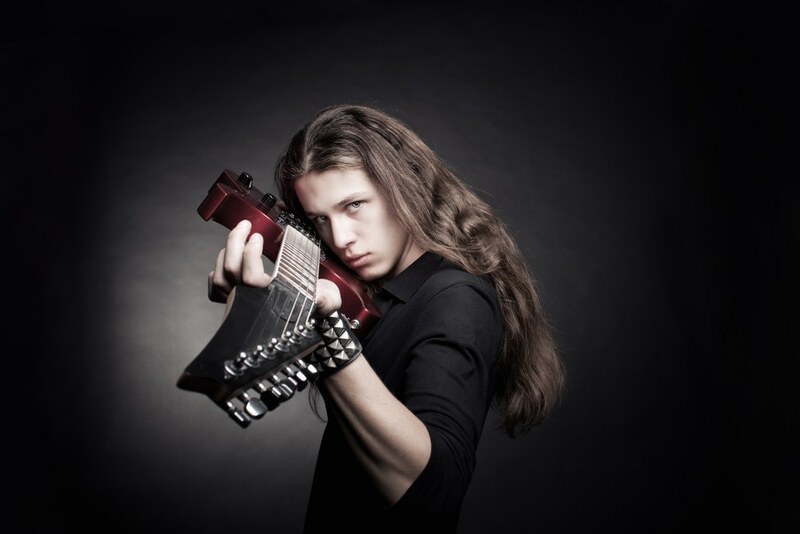 As you are well aware, more musicians tune their instruments down for playing metal. Sure, you’ve got some like Judas Priest who still play with standard tuning, but most play Drop B or even as low as Drop C (Two whole steps down for those of you who lost count). At these lower tunings, the gauge of the string begins to play a bigger role. Go too thin, and they will flap around like a skinny white flag of surrender. Plus, they simply will not offer the tension to create any decent noise. So the first step is to get your gauge right. Unless you are starting out, you probably won’t want to go any smaller than a 10 (beginners are allowed to start with a 9 and work their way up). This works really well for standard tunings and even Drop D.
Below Drop D, you will probably want to crank it up the gauge pretty significantly. Most will use at least an 11 gauge, with 12 being a pretty popular gauge. If you are willing to shop around, you can even find a 13. Most artists will have at least two guitars. One of them will be tuned to a standard or Drop D tuning. Then, they will run a second instrument with a heavier gauge that does their Drop B, C, and A tuning. Not only does it make it easier to switch between the tunings, but you really need to upgrade to a bigger string for those lower tunings, and the heavier weights simply are too difficult for most to enjoy playing them in standard tuning. Heavier mass means more vibration and more gain. As such, going with the biggest gauge you can play comfortably will help with your sound. Also, when two strings are tuned to the same pitch, the heavier one will be under more tension and require more force to get it vibrating. That greater force translates into a more aggressive resonance that really adds to your playing. If you have not already done so, you need to stop by my article on electric guitar strings. 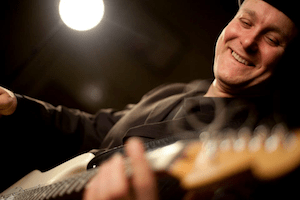 There, I go into detail on how to get the most life out of your sets and discuss a lot of the more intricate aspects of electric guitar nuances and needs. A little-known trick is to choose a string that works really well with your pickup. Now, this takes a little bit of experimentation but most will say that Nickel strings really seem to make a difference. Granted, there are a few outliers that still love their all-steel sets, but, for the most part, increasing the nickel content in the string really causes a more robust tone that also captures some of the quieter intricacies that tend to get washed out in most metal. In short, no. However, they will knock it out of tune unless you make some changes to your setup. And there are some limits as to how heavy your guitar and its floating bridge can go without doing some upgrades. There are some models which simply are too small to be able to accept the thicker 6th string. The first thing to try doing is making some adjustments to your floating bridge. You’ll know if your guitar needs it as the whammy bar base will physically begin lifting up off of the body. You’ll start by removing the screws on the back of your guitar to remove the back plate. This gives you access to the tension springs and the two adjustable screws. Adjust each screw 1/4th of a turn at a time until you’ve supplied sufficient tension to lower the base of the whammy bar. If this doesn’t work, you may need to unstring your guitar and replace those tension springs with stronger springs to handle the added heft of the larger gauges. You can make adjustments that will help your overall sound, but without a good set of strings that are fitted for the metal genre, it’s hard to get your kit adjusted to exactly what you want it to be! Fortunately, string sets are very affordable for your choice of instrument, as opposed to acoustic instruments that can run into the hundreds of dollars for a single performance level note. Part of your art as an electric guitarist is finding a way to configure your gear. It’s almost like piecing together a puzzle that is custom fitted to your taste and personality. So keep tweaking, keep learning, and keep playing! Researching and choosing the ultimate get-up is going to up your game in a way you didn’t know was possible!